With the second pick in the 2011 NFL draft the Denver Broncos picked Von Miller. With the very next pick the Bills took Marcell Dareus. Buffalo’s Pro Bowl DT didn’t appreciate getting passed over by Denver or Carolina, who took Cam Newton first overall. In an interview with Dareus not long after he was picked by Buffalo I asked him why he was so chapped about going third overall. This was his answer back in 2011. Then in an interview with Hall of Famer Michael Irvin on WQAM radio in Miami, Dareus back in 2011 promised to make life difficult for the Broncos, who he played against as a rookie. “Denver I’ll get a chance to play them in the regular season (this year) and I’m going to make it hell for them every time I play against them,” he said. Buffalo won that game in 2011 by a score of 40-14. Dareus had four tackles including one for loss. Four years later, however, Dareus is a more mature player and doesn’t hold any ill feelings toward the Broncos. Here’s a rundown of some of the more notable undrafted rookie free agents on defense that are available to sign beginning at 10 am Tuesday now that the new CBA has been approved by the owners and the players. The safety position is widely thought to have the most quality undrafted prospects of any position group, but Buffalo already has five on their roster, so at most they might add one. Where the Bills need to add is as ILB and CB in terms of roster numbers. Daniel Allen – Southern Connecticut St.
Ugo Chinasa – Oklahoma St.
Ryan Winterswyk – Boise St.
Orie Lemon – Oklahoma St.
Ryan Jones – Missouri St.
Jeron Johnson – Boise St.
Here’s a rundown of some of the more notable undrafted rookie free agents on offense that are available to sign beginning at 10 am Tuesday now that the new CBA has been approved by the owners and the players. Kevin Hughes – SE Louisiana St.
J.C. Brignone – Mississippi St.
Want to know how things went down for the Bills when they were on the clock at 3? Want to hear about the phone conversation between head coach Chan Gailey and Marcell Dareus when they made him the third overall pick? Hear about draft day 1 and day 2 from both Gailey and GM Buddy Nix in an exclusive look at the 2011 NFL from inside the Bills draft room. The exclusive posts Tuesday morning at 11 am on Buffalobills.com. Here’s a taste. It’s been a demanding pre-draft process for the Bills college scouting department leading up to the NFL draft. Very soon they’ll be back at it to grind for another 11 months. Bills GM Buddy Nix shed some light on the schedule the scouts will be resuming less than a month after the 2011 NFL draft. “Our scouts start the 22nd of this month in Orlando on every junior that will be available in the draft next year,” said Nix. No rest for the weary as Buffalo’s scouting department rolls out the suitcases again. Bills seventh-round pick CB Justin Rogers played his college ball at Richmond, but he’s in his home state of Louisiana working hard. He was also caught off guard when Buffalo picked him. In an interview with ESPN radio in Richmond, Rogers said he didn’t have much contact with the Bills. He recalled one meeting with a scout at the East-West Shrine game. He’s currently working out with a trainer he knew from high school in his native Louisiana. Here’s the radio interview. The Bills weren’t the only coaching staff at the Senior Bowl that wound up picking players that were performing down there through the course of the practice week and game in Mobile in late January. The other coaching staff did as well. With a total of nine picks, Buffalo took three players in last weekend’s draft that they spent a week with at the Senior Bowl including two on their South Team roster. The Cincinnati Bengals took two players from the Senior Bowl with the eight picks they had last weekend, one of which was a quarterback in Andy Dalton in round 2. They also took OL Clint Boling in round four out of Georgia. Both of those players were on Chan Gailey’s South Team. The exposure on the practice field and in the meeting rooms going over tape and scheme is where the coaching staffs really felt they got a handle on how the players would operate as professionals, something that’s hard to get in an interview setting. Pairing that up with what you can get off of game tape in terms of playing ability paints a pretty complete picture. Bills second-round pick Aaron Williams was apparently very honored having his name read by Bills Wall of Famer Andre Reed on day two of the NFL draft last weekend. Here was his tweet to Andre earlier today. Nice to see a rookie respecting those that came before him. ESPN draft analyst Mel Kiper, called Bills second-round pick Aaron Williams one of the steals of the 2011 draft class. “Aaron Williams I really like at that point where they got him,” said Kiper in a national conference call this week. “He can play corner, he can play safety, he’s the toughest run support corner that I’ve graded in the last five years. Here is his full list of draft steals. ESPN Monday Night Football analyst Jon Gruden had his own assessment of Marcell Dareus and why he thought Dareus was superior to Auburn’s (and now Detroit’s) Nick Fairley. Gruden gave Dareus the edge because of his versatility and better all-around game. The Bills draft grades have been pretty favorable on the heels of the 2011 draft, but in a couple of instances they’ve been excellent. A day after receiving an ‘A’ plus from Rick Gosselin of the Dallas Morning News, Buffalo got another ‘A’ grade from FOXSports. Comments: They did some great things in WNY this weekend. 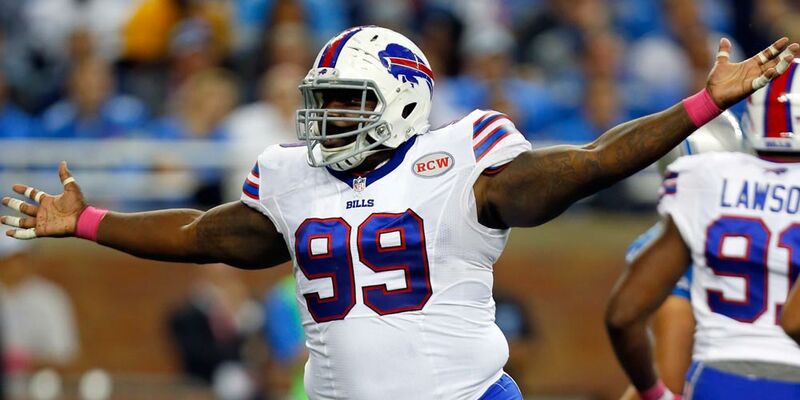 Marcell Dareus is the perfect fit for this defense. … Give Chan Gailey and company a lot of credit. Bills GM Buddy Nix commented on the level of trade talk they encountered during draft weekend and by the sound of it there was a lot of chatter on the phone lines. In an interview on the Shredd and Ragan show on 103.3 The Edge, Nix said there were more than a dozen inquiries by teams per round. Nix has said several times that he doesn’t like moving up and down the draft board. He likes to sit in their spots and pick, and it proved to be a sound approach this time around as the Bills from top to bottom appear to have one of their better draft classes in the past 10 years. The Bills were one of only nine teams that did not make a single trade draft weekend. One of the more on the spot mock drafters, Rick Gosselin of the Dallas Morning News also put out his draft grades for the 32 NFL clubs, and had high marks for Buffalo. Here was his synopsis. The Bills had nine selections and five of them were above value for the round they were drafted: Williams, Hairston, the two Whites and Rogers. A good draft becomes great in the third day. The Bills hit for the cycle on Saturday. Gosselin had only one other NFL club with an ‘A’ grade besides Buffalo and that was the Baltimore Ravens. ESPN draft analyst Mel Kiper, who gave the Bills an overall grade of ‘B’ in this year’s draft, called fourth-round pick OT Chris Hairston the most critical piece of Buffalo’s draft class. “With the offensive line you can only do so much,” said Kiper. “With the offensive line there was a big drop off after the top group. That’s why I think the key guy is going to be Chris Hairston. Chris Hairston has a lot of ability and potential. I think he’s not yet where he needs to be. Any time you get a kid that’s 6’6 ¼” and 326 pounds and is very, very strong in the upper body, he’s got incredibly long arms. The kid is a talent. With Bills offensive line coach Joe D’Alessandris, Hairston will be in good hands. Head coach Chan Gailey said over the weekend he envisions Hairston as a right tackle, even though he played left at Clemson. And Kiper apparently doesn’t put a whole lot of stock in Erik Pears, who is the Bills odds on favorite to be the starting right tackle in 2011, after a couple of strong starts last season as a late year pickup. For those of you Bills fans that are intrigued by Buffalo’s seventh-round draft pick, who played his senior season at 430 pounds, you’re going to be surprised by his athleticism. Bills GM Buddy Nix said that NT Michael Jasper has a vertical leap of 33 inches, a 9’5″ broad jump and can dunk a basketball. He’s also now down to 378 pounds. Here’s a video of his training to get an idea of how athletic he is, basketball dunk included. Enjoy, it’s impressive. Bills took a defensive tackle with their final pick, a very big defensive tackle. Michael Jasper out of Bethel has about 60 pounds on Bills top pick Marcell Dareus. 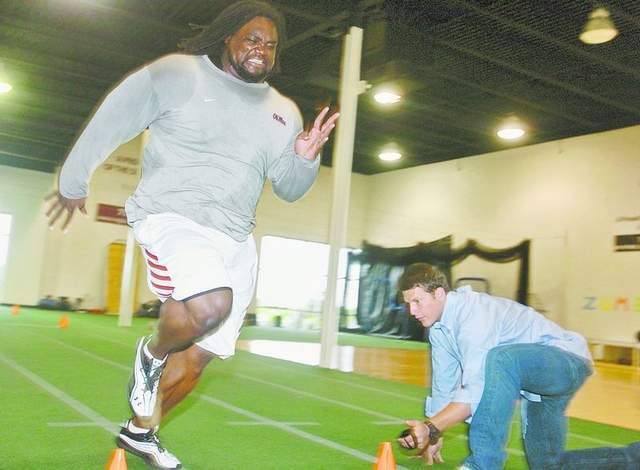 Jasper (6’4 1/2″, 378) played in 2010 at 430 pounds (according to him), but with the Bills scout Matt Hand practically stalking the small school prospect over the past year, he was motivated to drop the weight for a shot at an NFL career. Jasper said the heaviest he ever weighed was 448 pounds. Here’s a photo of the big man when he was in training getting his weight down these past four months. Buffalo’s first pick from a smaller school, CB Justin Rogers from Richmond an FCS (Div. 1-AA) school. Here’s what Bills national scout Darrell Moody had to say about him. Bills sixth-round pick Chris White was watching the draft pretty closely on TV all weekend, until he decided to take a break from it. The stuff that makes draft weekend unique. Buffalo just took another player they had at the Senior Bowl in Mississippi State ILB Chris White. White played for Chan Gailey’s South Team at the Senior Bowl. He was a junior college transfer from Mississippi Gulf Coast CC.